In the days following the Christmas madness, there's nothing more homey than a freshly baked coffee cake. 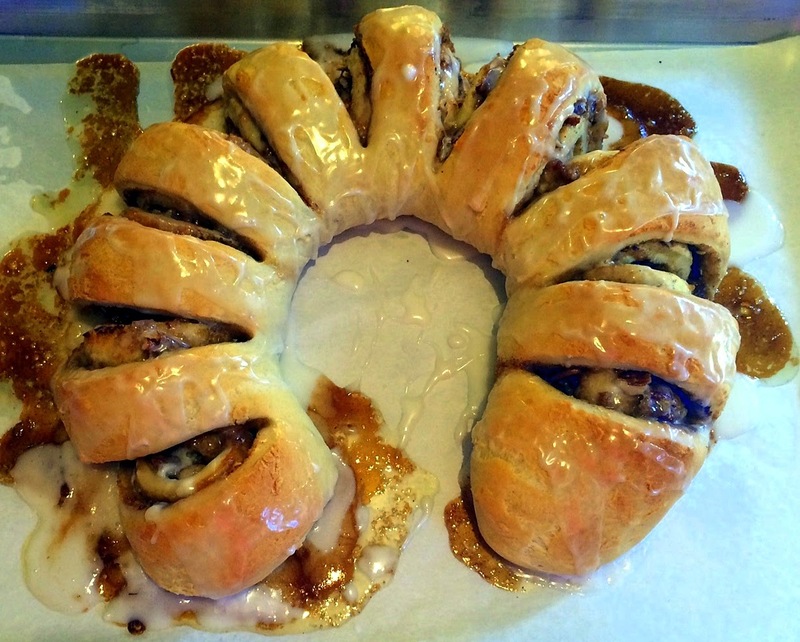 However, at the request of my DS, who wanted cinnamon buns on Christmas morning, that's when I made this. Never mind that I was expecting 16 relatives and friends for dinner that day! 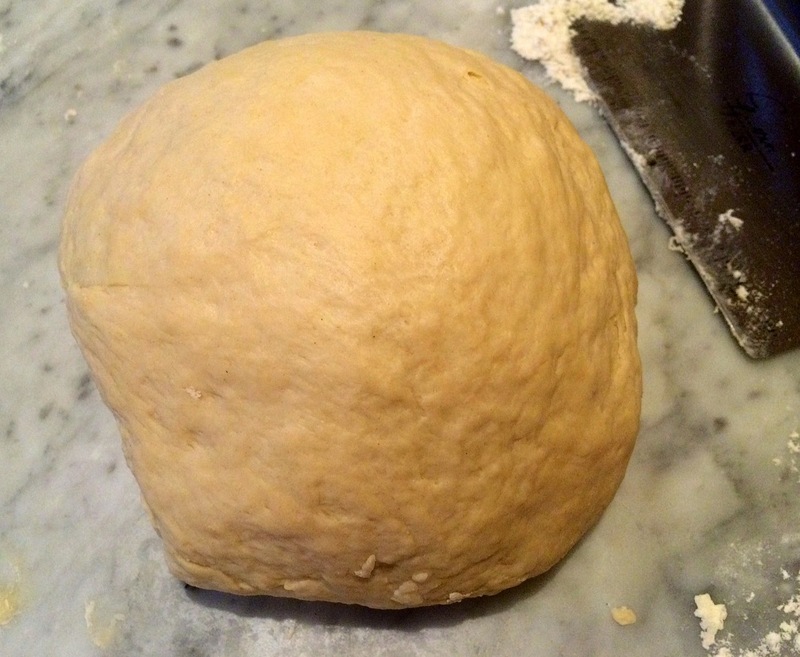 This is a yeast dough, and it has to rise a couple of times, so planning ahead is essential. Because I wanted to bake this Christmas morning, I prepared the dough Christmas Eve, in between our dinner out (main feature: martinis) and the gift-wrapping frenzy that began just as the clock struck midnight. 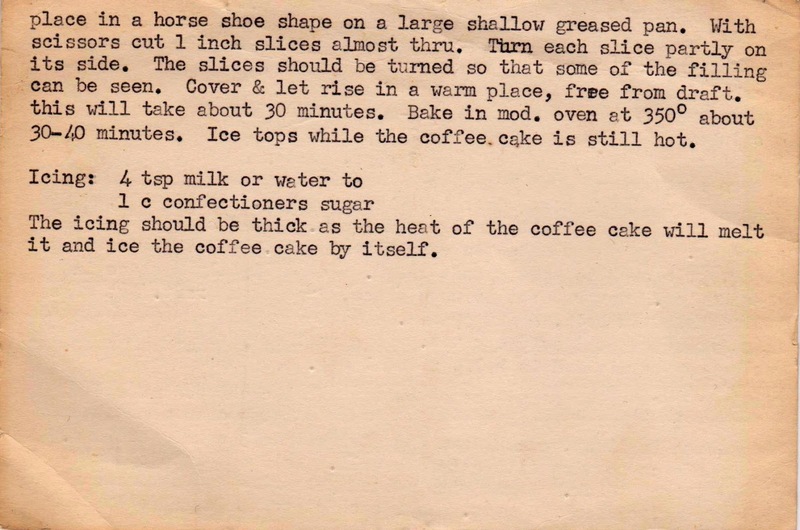 Although the original request was for cinnamon rolls, I thought this vintage coffee cake recipe would make a nice substitute, for it's really more of cinnamon rolls baked in a horseshoe shape. 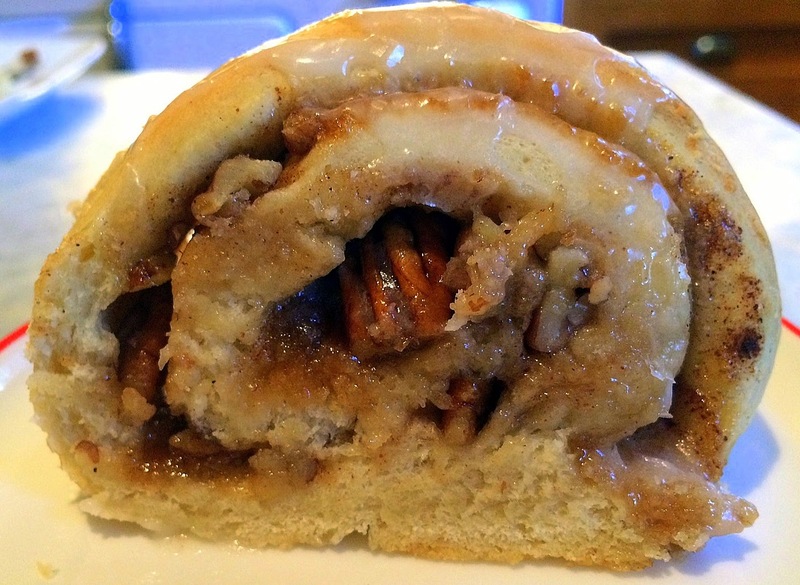 To serve, simply slice off a roll (or two). 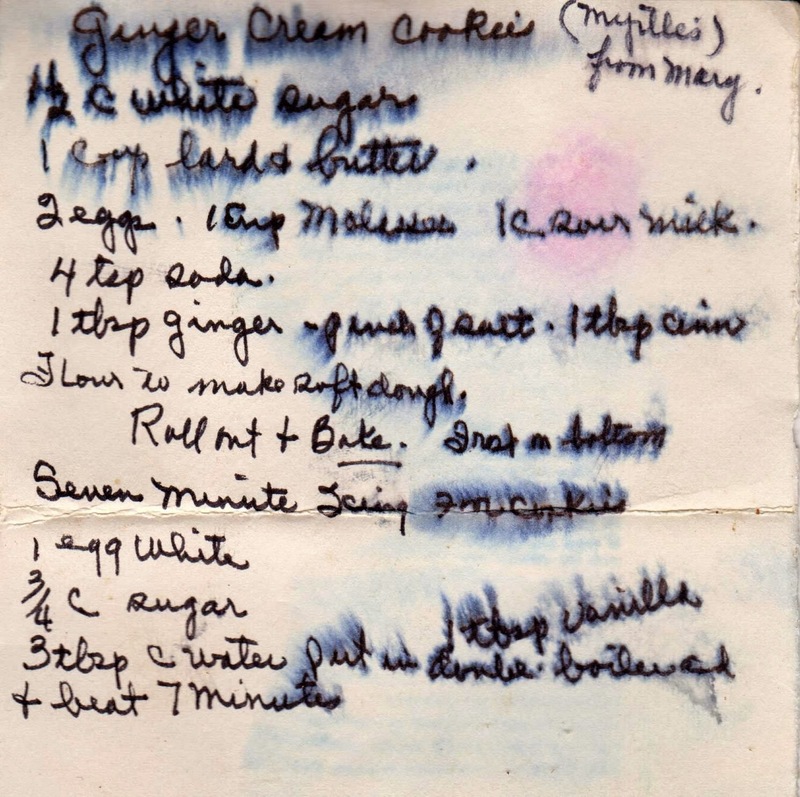 The recipe is part of a collection I bought from a Florida estate. I'd guess it's from the late 1940s. 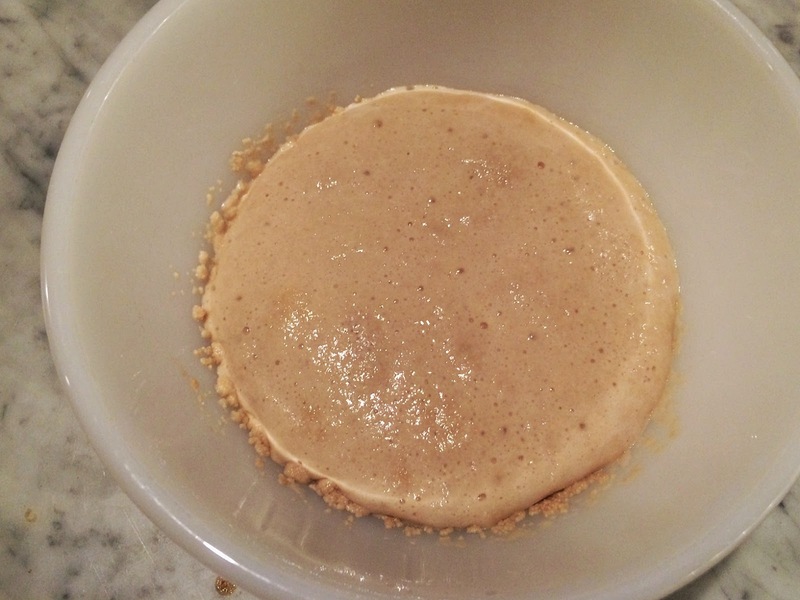 Begin by placing the yeast in warm water. Wait a few minutes until it foams. Scald the milk, add the butter, sugar and salt. 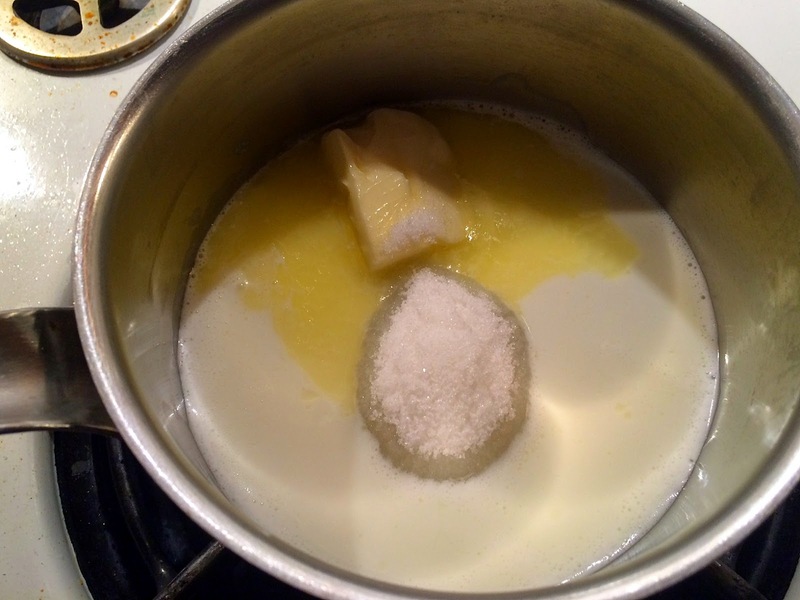 Add two cups of flour and the yeast to the milk mixture and add the eggs. 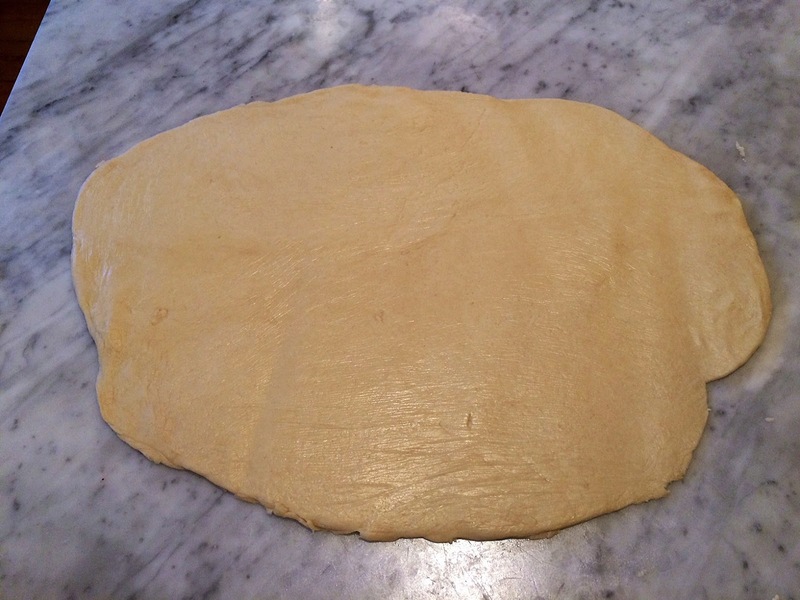 If you've refrigerated the dough, remove it the next morning and let it come to room temperature before rolling it out. 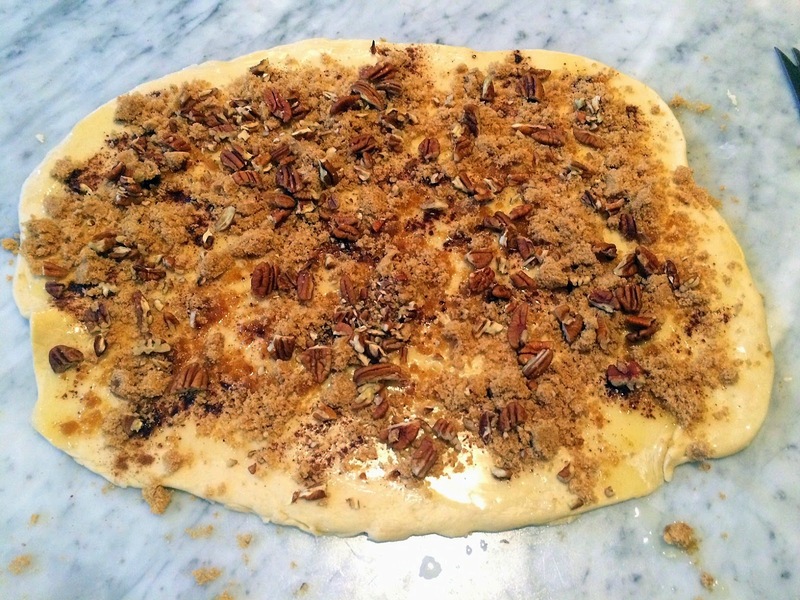 Brush the dough with melted butter, and add cinnamon, brown sugar and nuts. Roll it up from the long end. 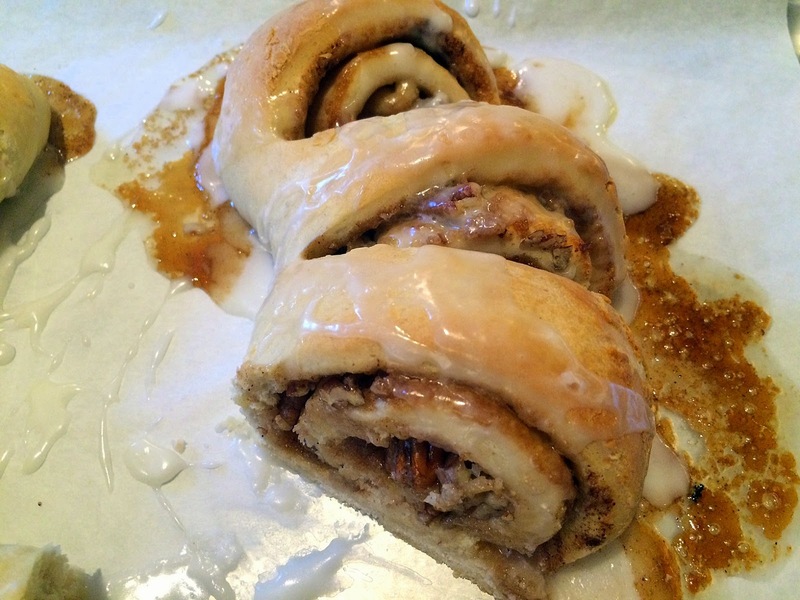 Place on a baking pan, covered with parchment paper, and slice the "rolls." Cover and let it rise for about 30 minutes. Bake about 30 minutes. 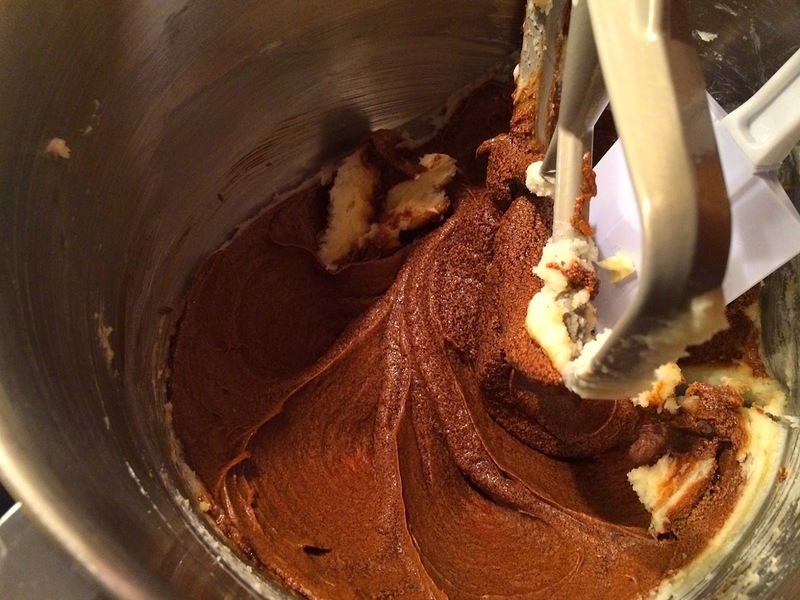 While it's baking, make the icing and pour it over while the cake is still warm. 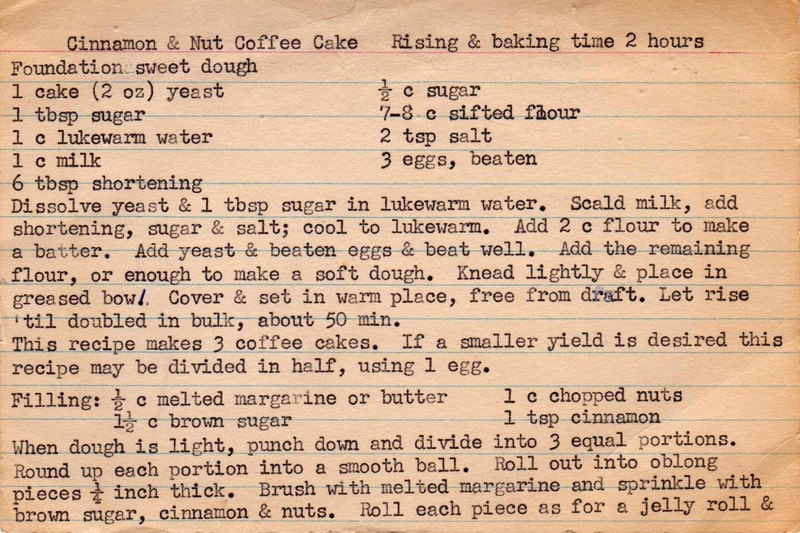 Production notes: I made just half of the recipe and got one large coffee cake from it. 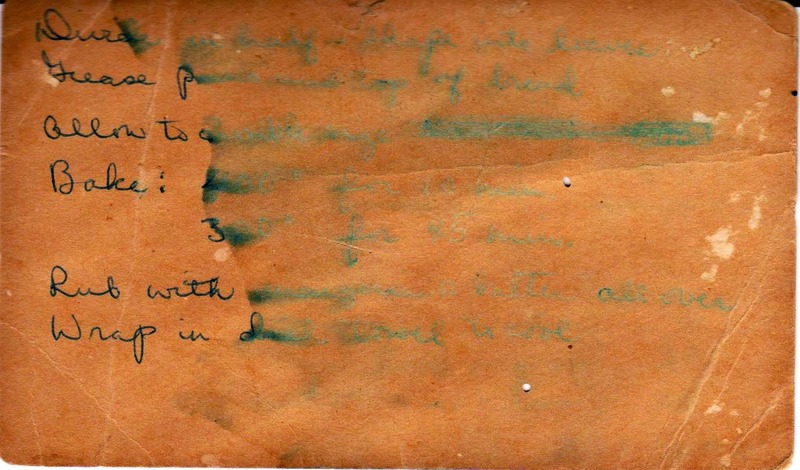 (The original says it makes three). I used two packets of active dry yeast instead of the one cake called for, and butter instead of shortening, but otherwise followed the recipe exactly. 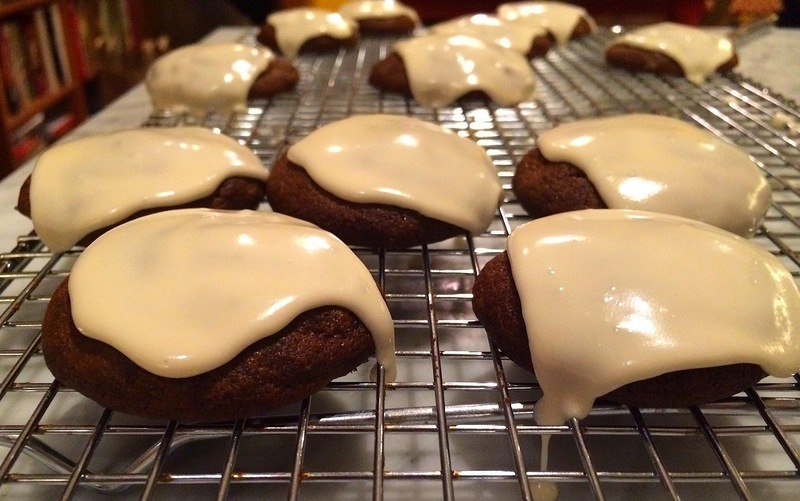 If you can't bear to cut out another Christmas cookie, consider this festive -- and snappy -- holiday cookie. 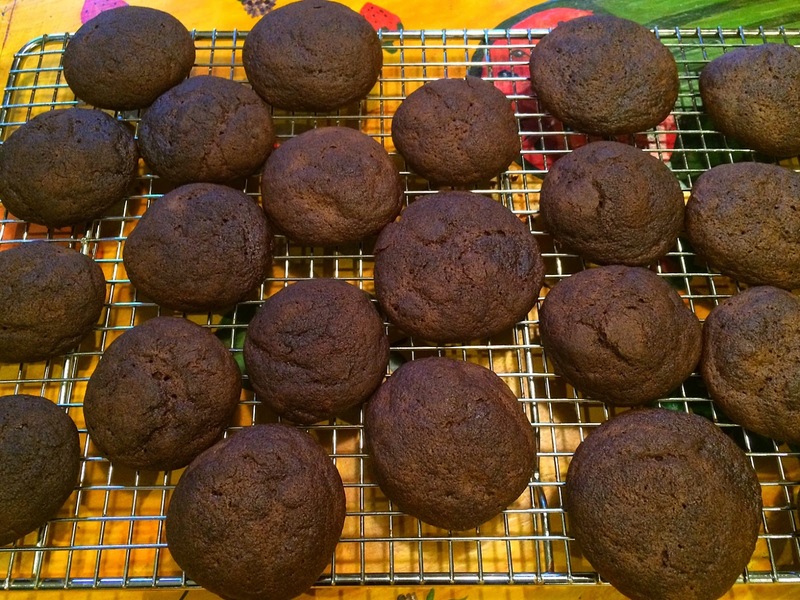 Not only are these gingersnaps delicious, but they are very easy to prepare. That's because the dough is formed into logs and sliced, relieving the baker of the tedious task of rolling and using cookie cutters. 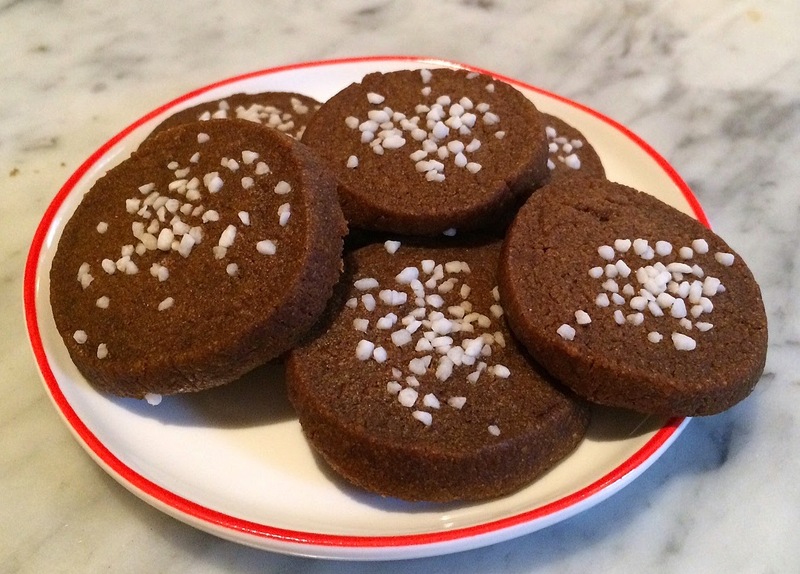 It's a modern-day incarnation of the refrigerator cookie, once a staple of nearly every mid-20th kitchen. Today it is seen most often in the slice-and-bake versions manufactured by Nestle's and the like. 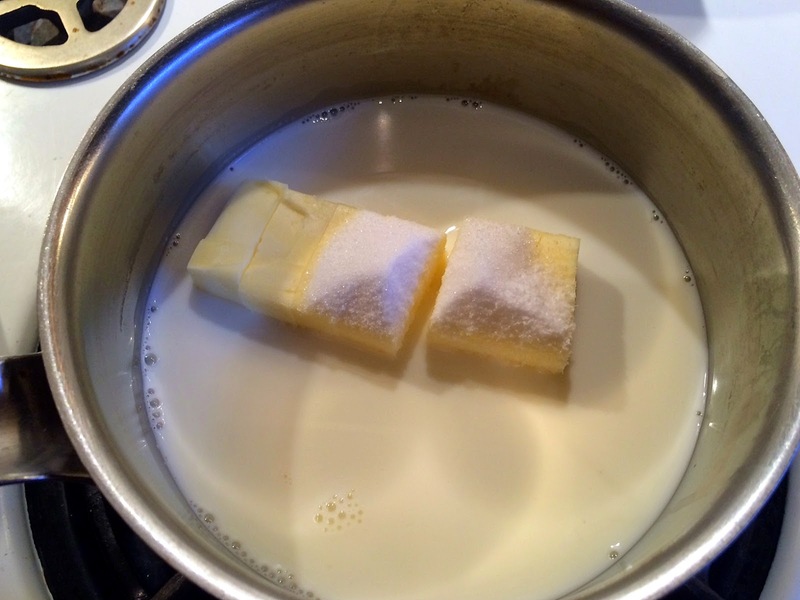 Start by mixing the butter and sugar. 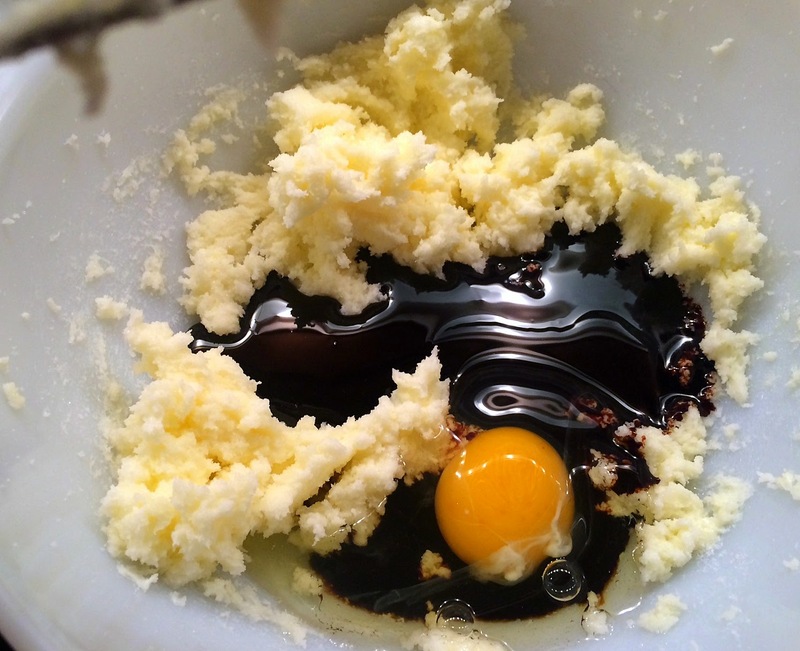 Add in the egg, vanilla and molasses. The dough will be quite stiff after the dry ingredients are incorporated. 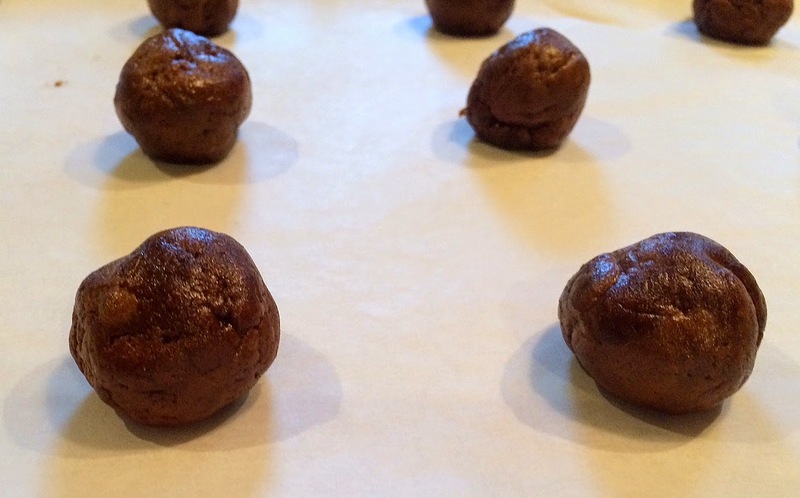 Form into three balls, cover in plastic and refrigerate. 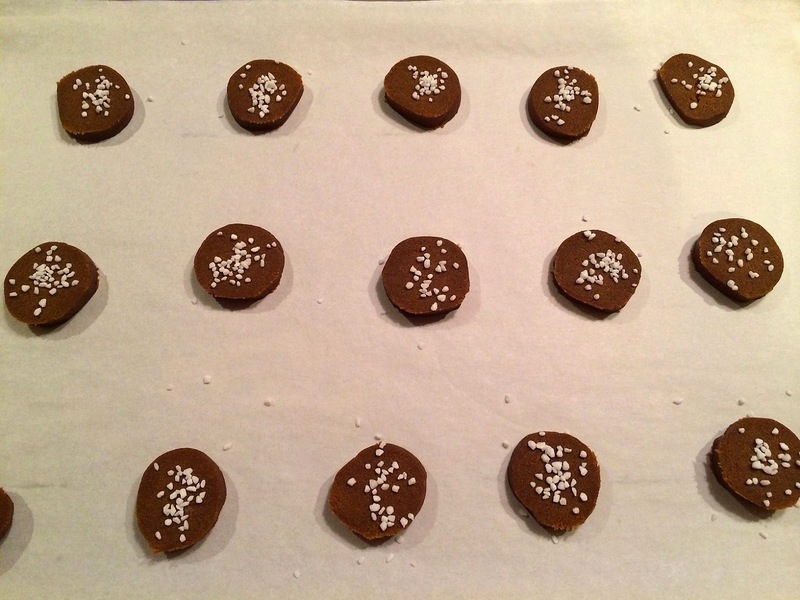 Place on parchment lined cookie sheet and sprinkle with sugar if desired. I used pearl sugar, purchased a while back at Ikea. 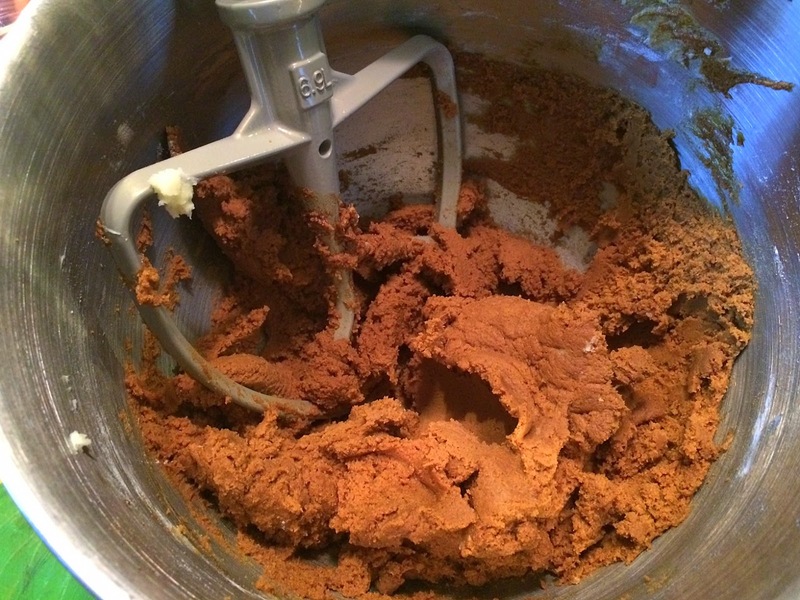 Close up of unbaked cookie. 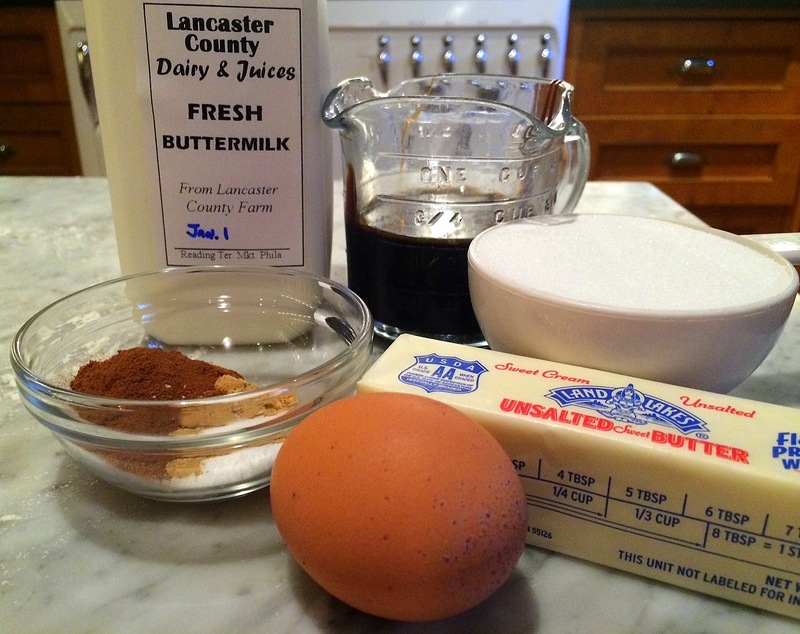 Add the vanilla, egg and molasses and continue creaming until well combined. In another bowl, combine the flour and spices. 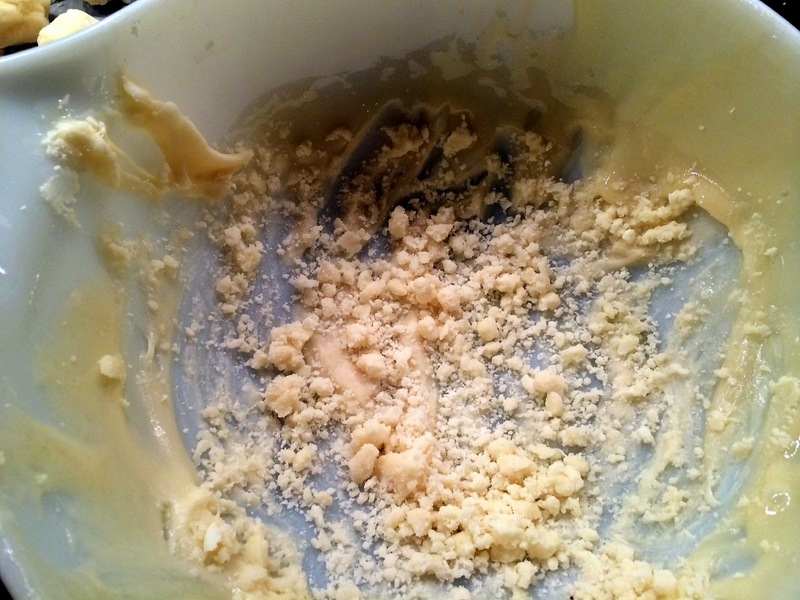 Add the dry ingredients to the butter mixture and combine well. 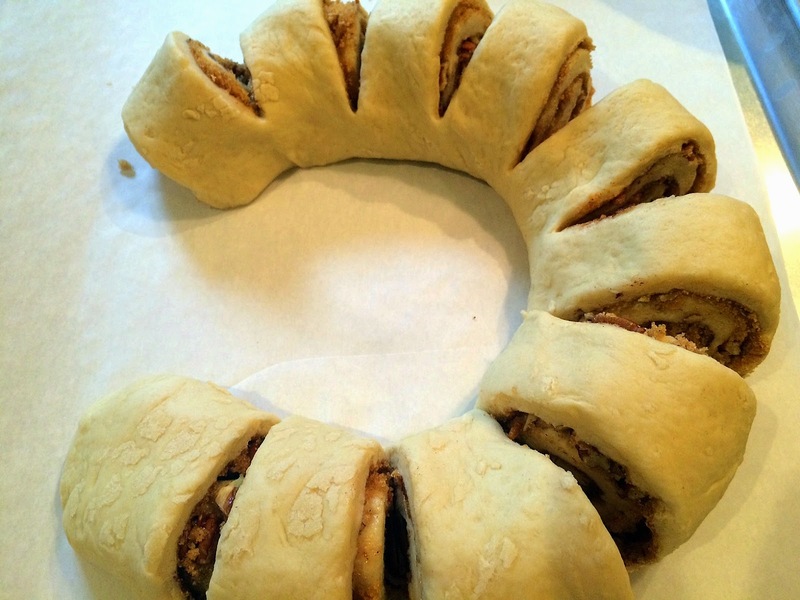 Divide the dough into three equal portions, wrap in plastic and chill for 30 minutes. 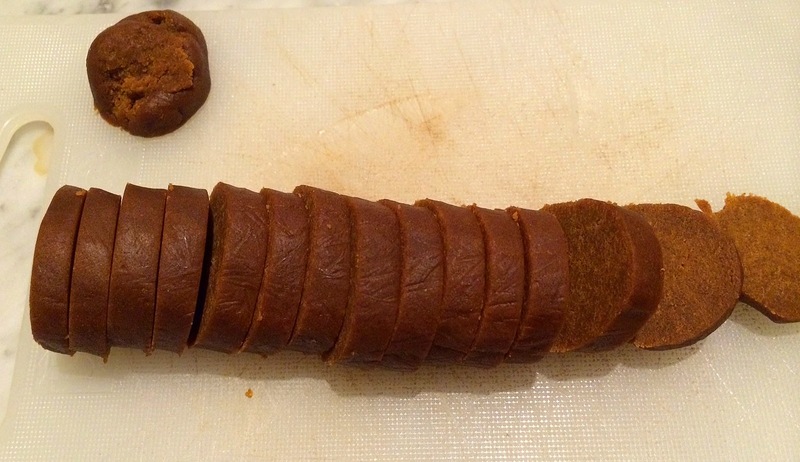 On a lightly floured board, roll each piece of dough into a log-shaped cylinder that's about 1 3/4 inches in diameter. 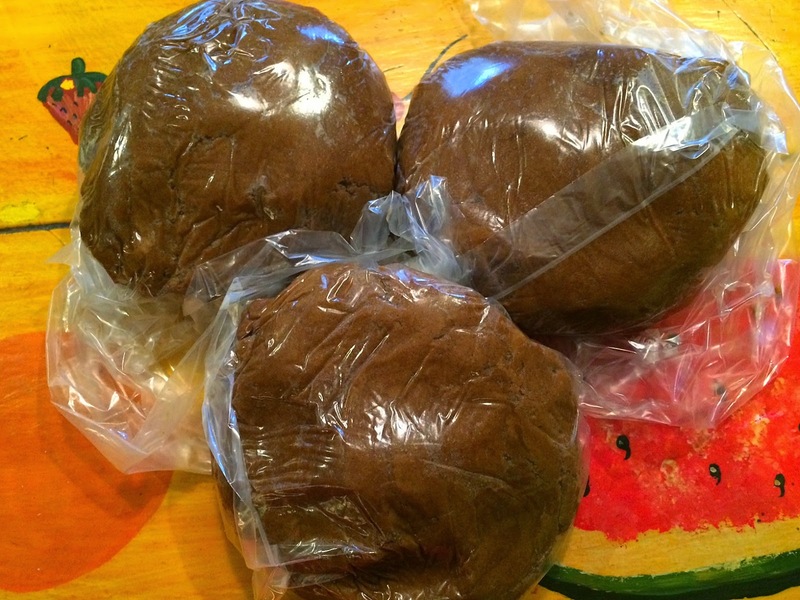 Wrap in plastic and freeze about 30 minutes, or til firm. Slice the logs into cookies about 1/4 inch thick and place on the cookie sheet. Candy making is a lost art, but that wasn't the case in the early 1900s when candy (think fudge, divinity, toffee) was commonly made in home kitchens. 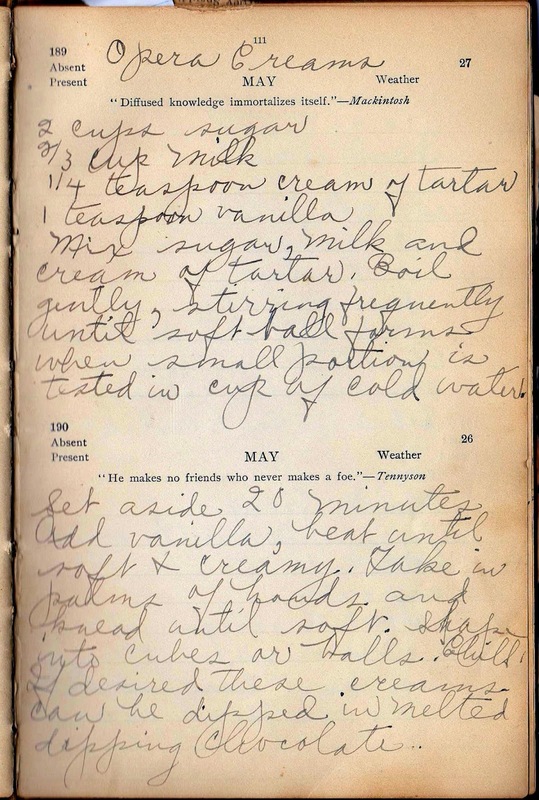 This is another recipe from the collection of Mrs. W.L. Honsinger who lived in rural Vermont at the turn of the 20th century, and probably found that making candy at home was easier than getting to a store that sold it. 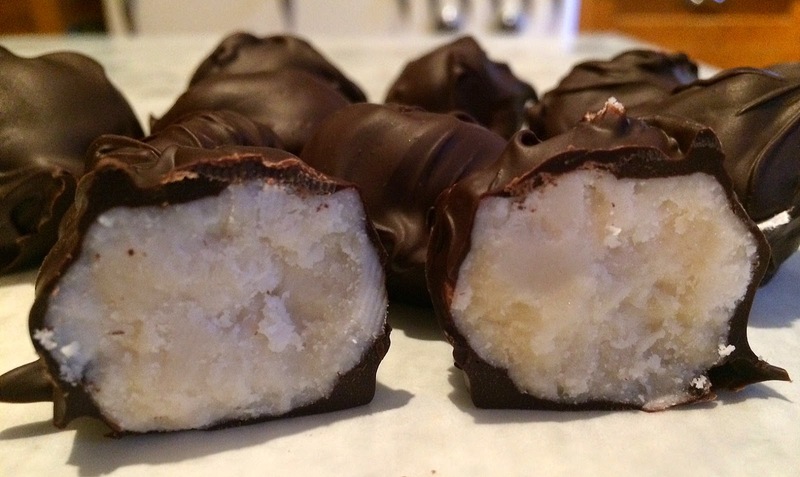 Plus, homemade candy then, as now, is much more economical. This candy is pretty good, and very, very sweet. 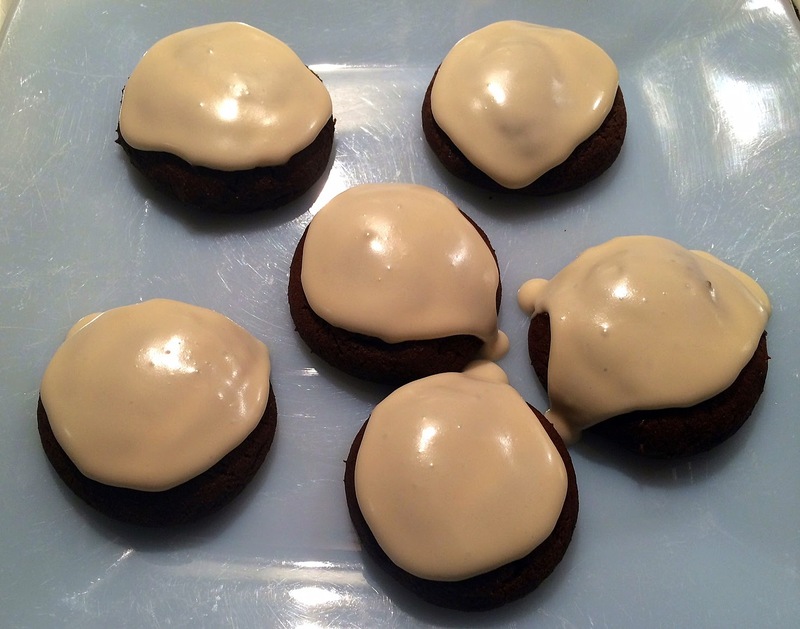 The centers are very temperamental, and I may have overcooked the sugar syrup so they were less creamy than desired. Still, I had no complaints from my tasters. 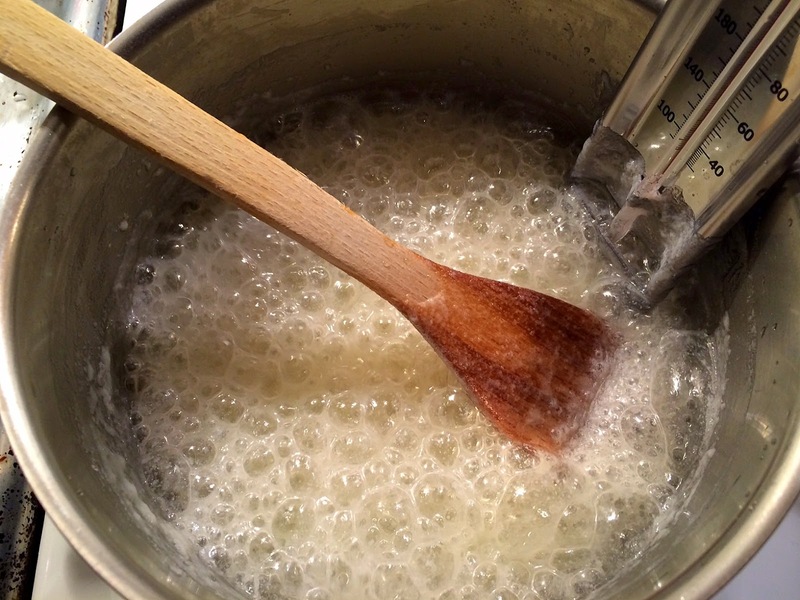 Start by boiling the milk, sugar and cream of tarter until the mixture reaches 235 degrees. Let it cool for 20 minutes and add the vanilla. For ease of beating, I transferred the mixture to a bowl. 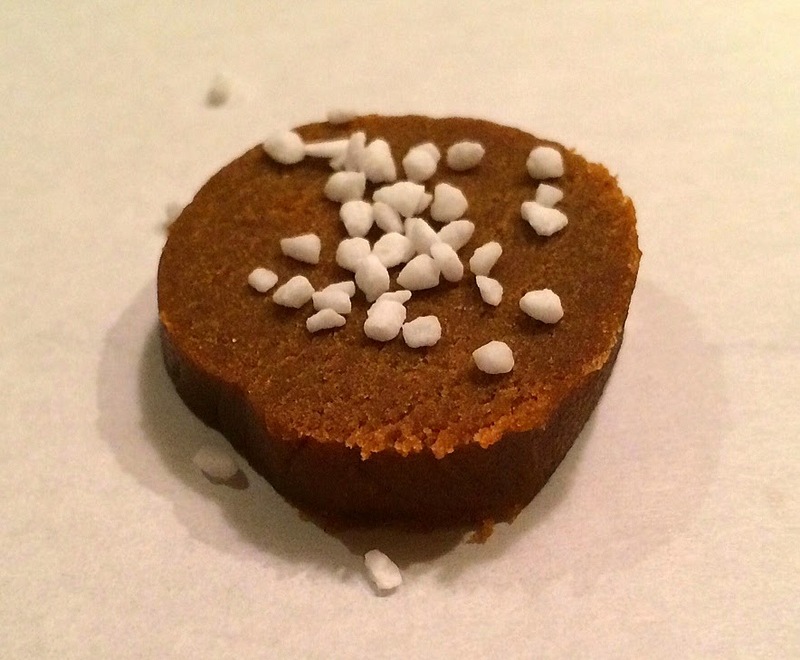 Forming the candy was easy, even though it was a bit too crumbly from overcooking the syrup. 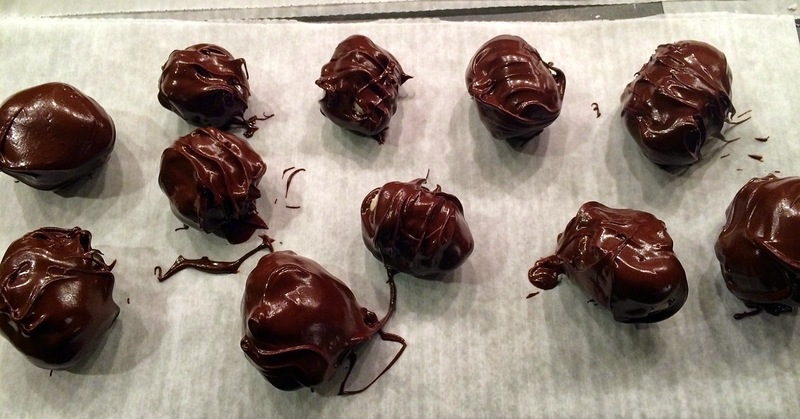 You can get fancy with the chocolate coating (tempering the chocolate, etc.) but I just melted a couple of handfuls of chocolate chips in a double boiler. The recipe is below, and below that I wrote out clearer instructions. If you don't have a candy thermometer, you can test the syrup in a glass of cold water (it should form a soft ball when a small spoonful is placed there, but I never found that method reliable). 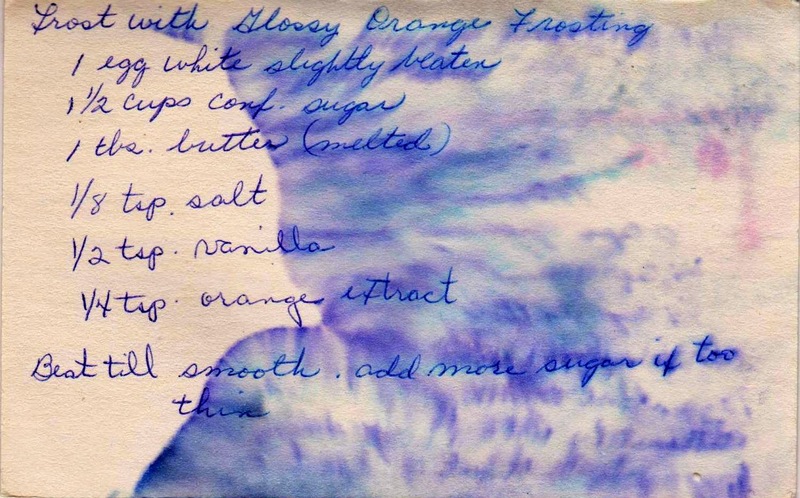 Combine sugar, milk and cream of tarter in a two-quart saucepan. Boil gently, stirring frequently until it reaches 235 to 240 on a candy thermometer. Set aside for 20 minutes and add vanilla. Form small balls (using your hands) and chill. 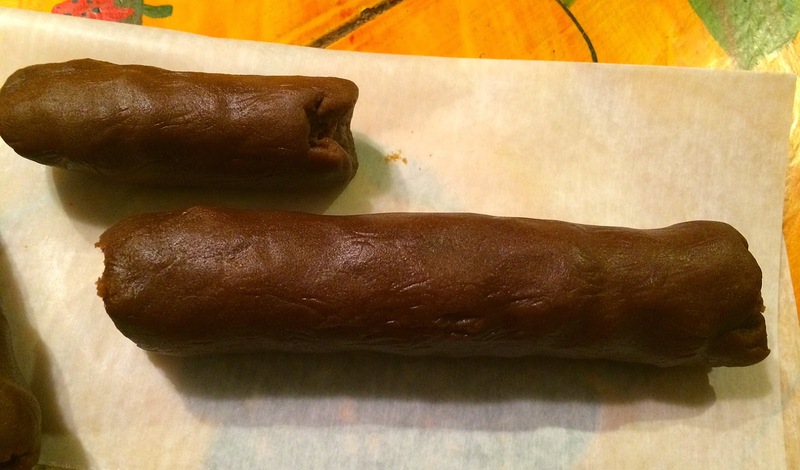 Using a fork, dip the candy, coating completely. 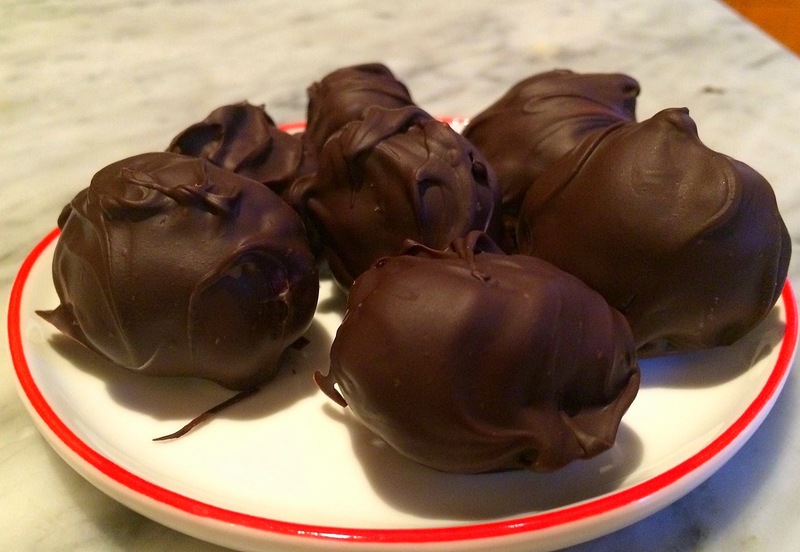 Set aside until the chocolate hardens. 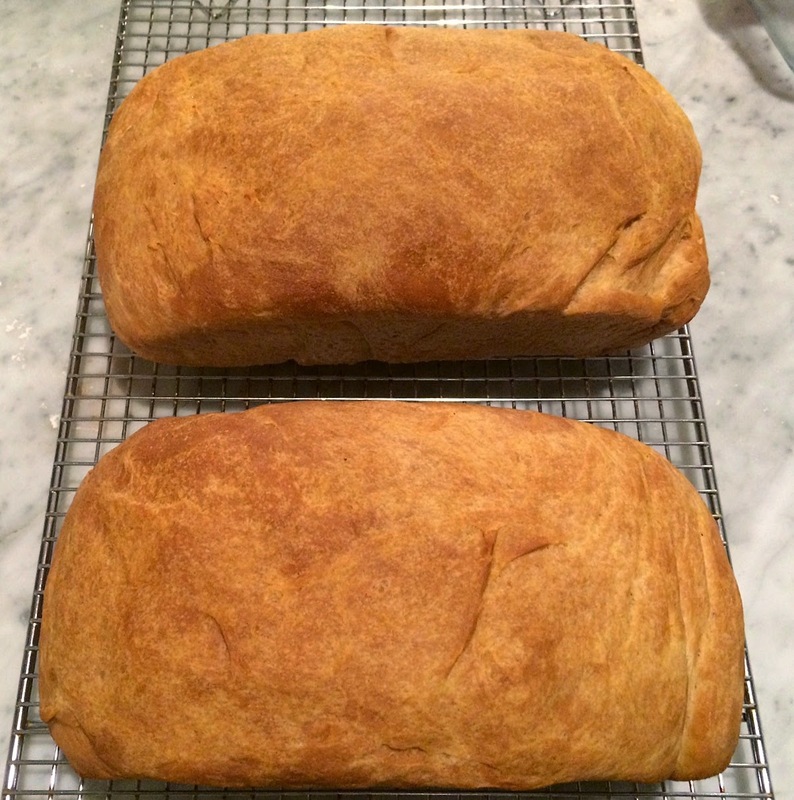 Instead of complaining about the relentless rainy downpour in New York yesterday, I decided to use the weather to my advantage and bake bread. 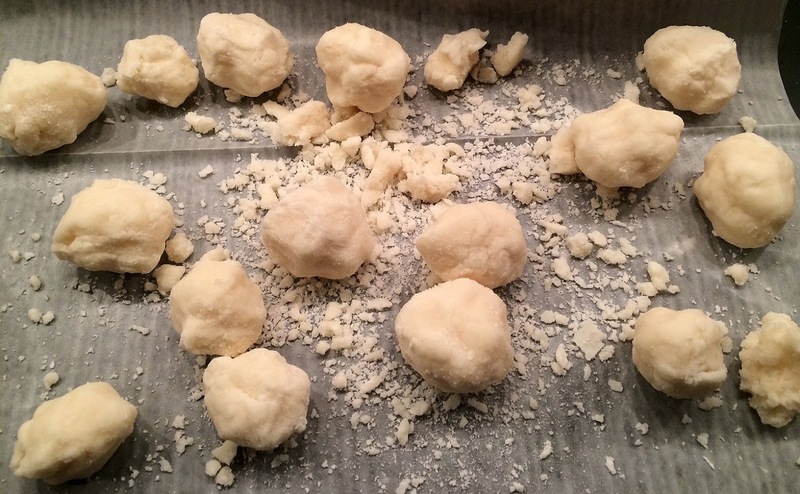 For while humidity will torpedo many a kitchen endeavor (meringues, most candy and nearly anything involving egg whites), low pressure days are perfect to use yeast, the theory being that it works better (i.e., rises more easily) without the competition of high pressure air pushing it down. 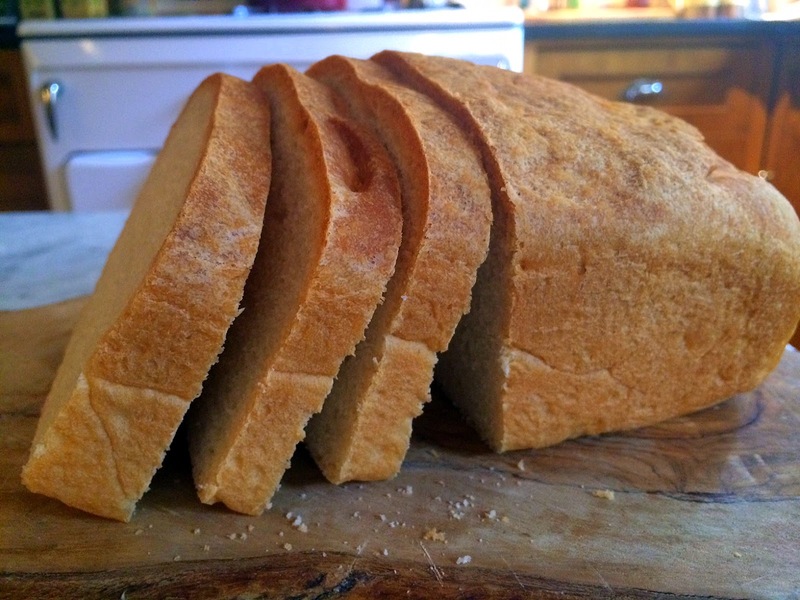 Bread baking is easy, requires time (but not much of the cook's time), fills the house with a marvelous aroma -- and then allows you and your guests to enjoy the freshest bread imaginable. The vintage recipe I chose called for heating milk, sugar, salt and butter in a saucepan and letting it cool to lukewarm. 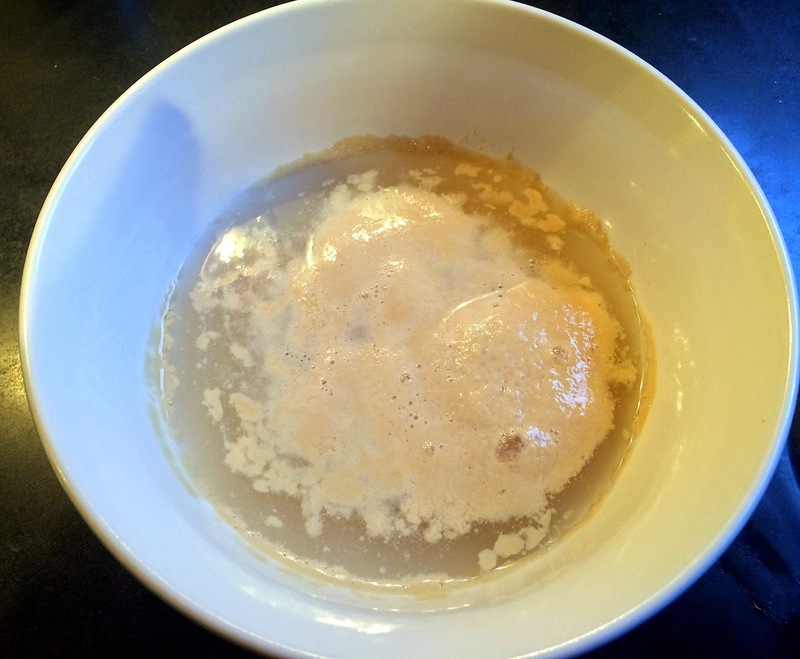 Meantime, pour one cup of warm water in a bowl and sprinkle the yeast over it. Stir to blend. (The water should be between 105 and 110 F. If the water is too cold, the yeast won't bloom; if it's too hot, the yeast may die.) You can use a candy thermometer or just sprinkle some drops on your wrist -- it should feel warm, not hot. I also add a tiny bit of sugar to hasten the yeast's bloom. 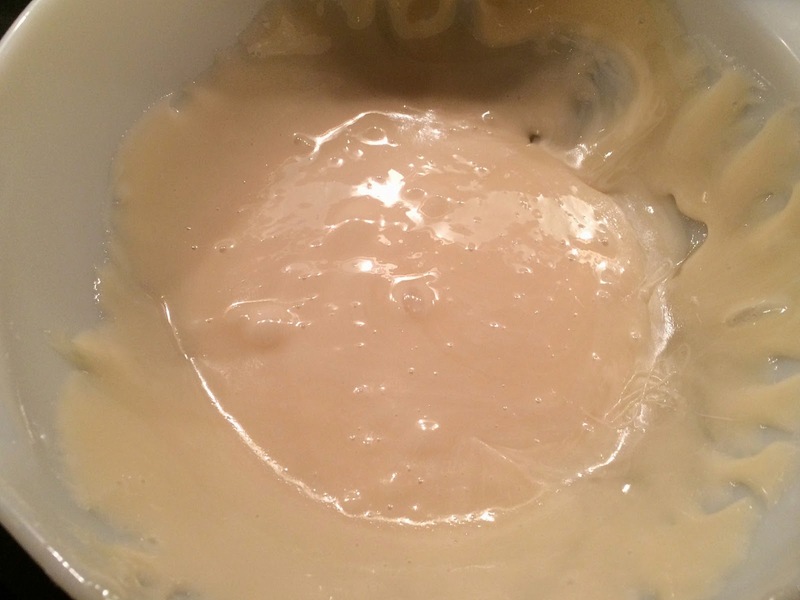 After five or ten minutes, the mixture should look like this and you know the yeast is working. If it doesn't, check the date on your yeast package (might it have expired?) and try again with a fresher yeast, warm water and a bit of sugar. 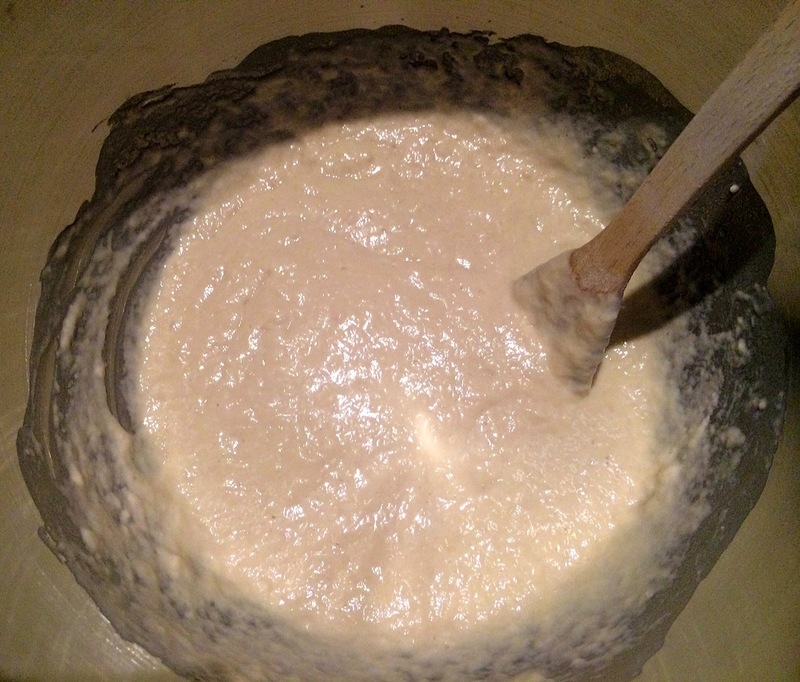 Combine the yeast and the milk mixture in a large bowl. 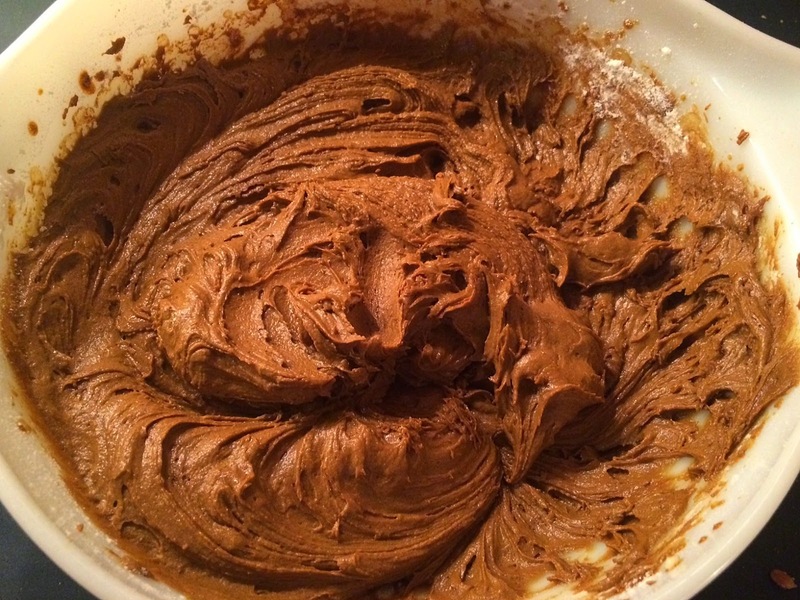 Mix in three cups of flour and stir until nearly smooth. Add in the rest of the flour and combine. 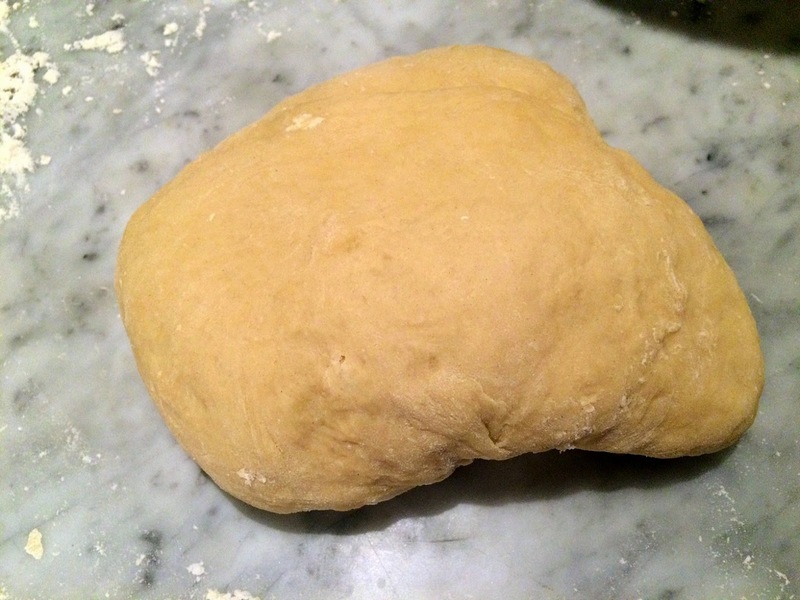 Turn the dough out onto a floured work surface and knead until smooth and elastic. Place in a greased bowl, cover with a cloth and let it rise in a warm spot until double, about one hour. 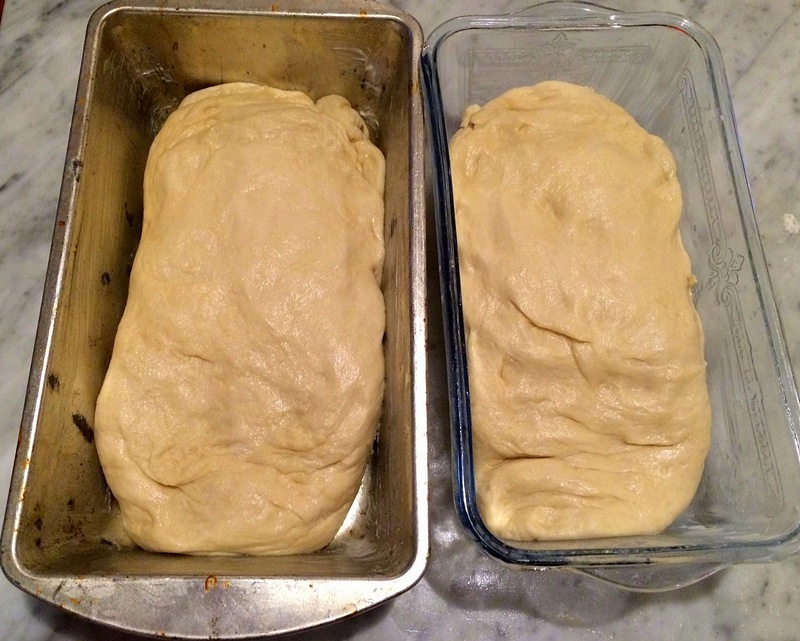 Punch it down (as satisfying as it sounds) form into two loaves and place in greased pans. Cover again and let rise until doubled. When the loaves look like this, brush the top with butter or shortening and place in a preheated 400 F oven. After ten minutes, reduce the heat to 300F and let bake for another 45 minutes. 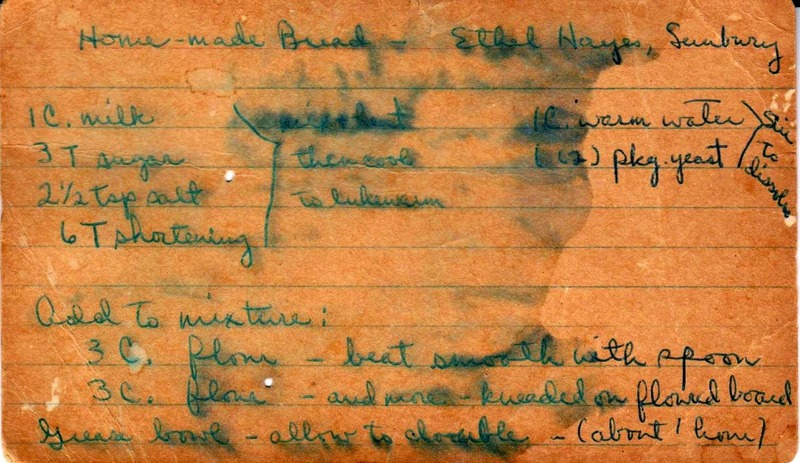 Production notes: I thought I followed this recipe exactly (before I spilled orange extract from another baking project all over the recipe card), but later realized I had used only one package of yeast instead of two -- and it still came out fine, because of the low pressure and/or the power of yeast. The moral here is: You can't screw this up, or even if you do, it still works and is delicious. I also used butter instead of shortening. Full recipe typed out below. 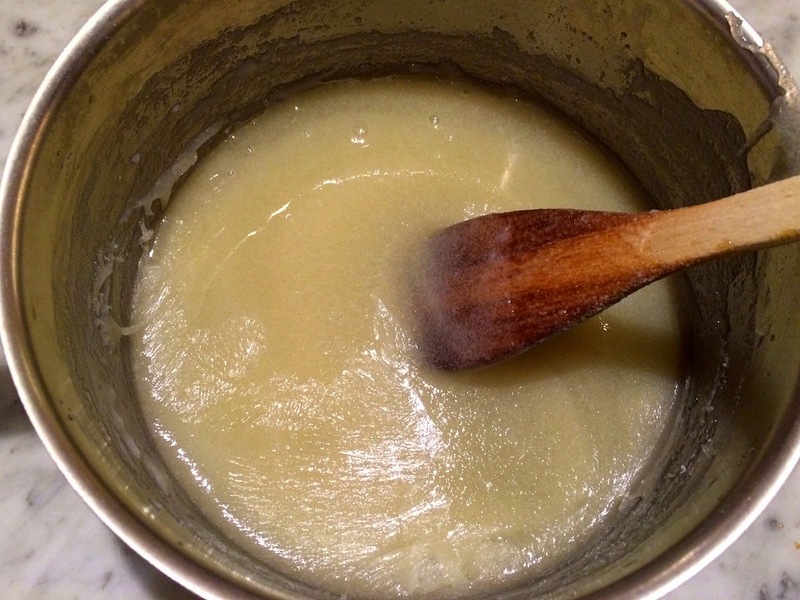 Mix milk, sugar, salt and shortening (butter) in a saucepan and scald. Set aside and cool to lukewarm. 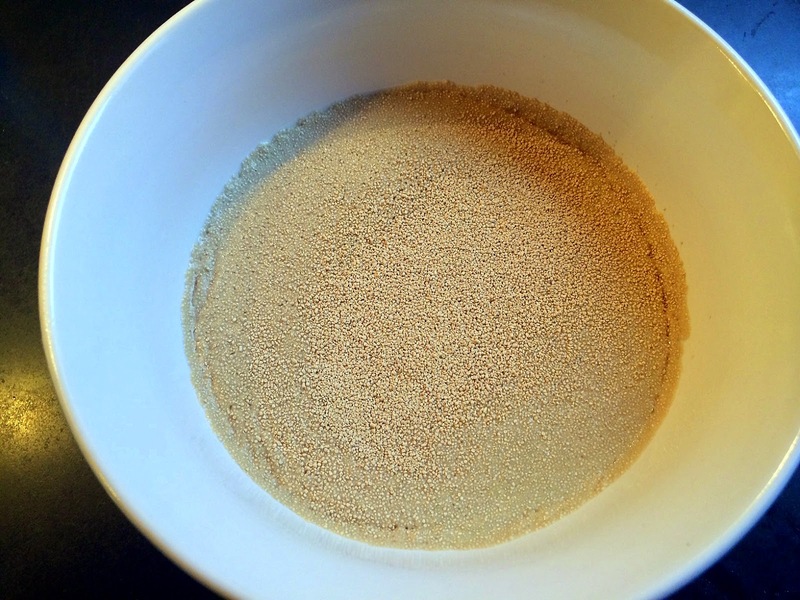 Sprinkle two envelopes of yeast in one cup of warm (100 F) water and set aside. Combine two mixtures and add three cups of flour. Stir with a wooden spoon until smooth. Add three more cups of flour and stir until combined. 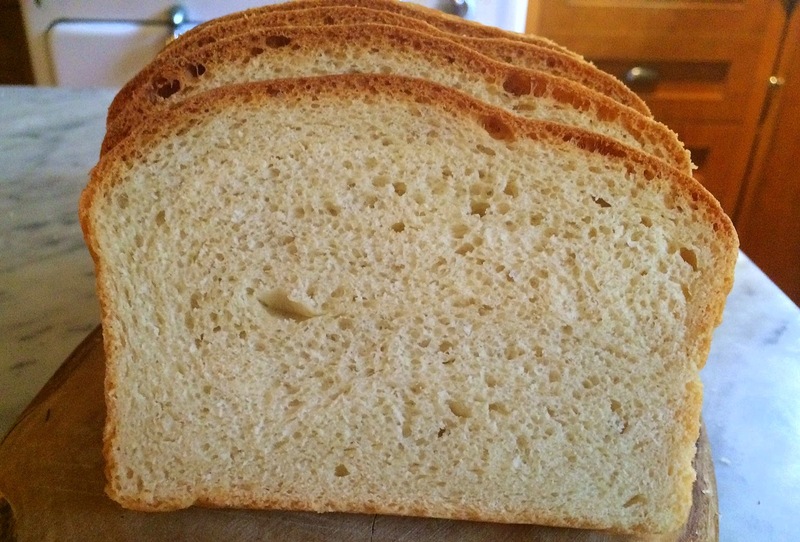 Turn out on a floured board and knead until smooth and elastic. 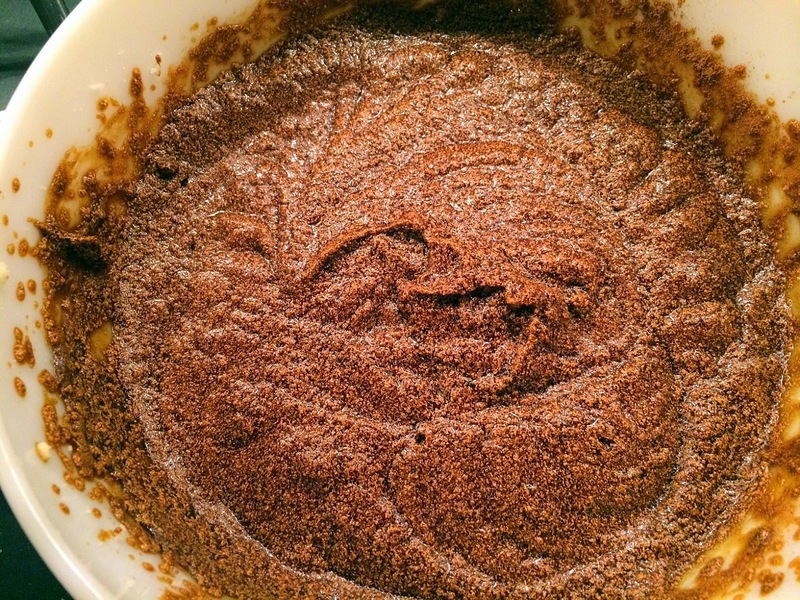 Place in greased bowl, cover with a cloth and let rise until doubled (approximately one hour). 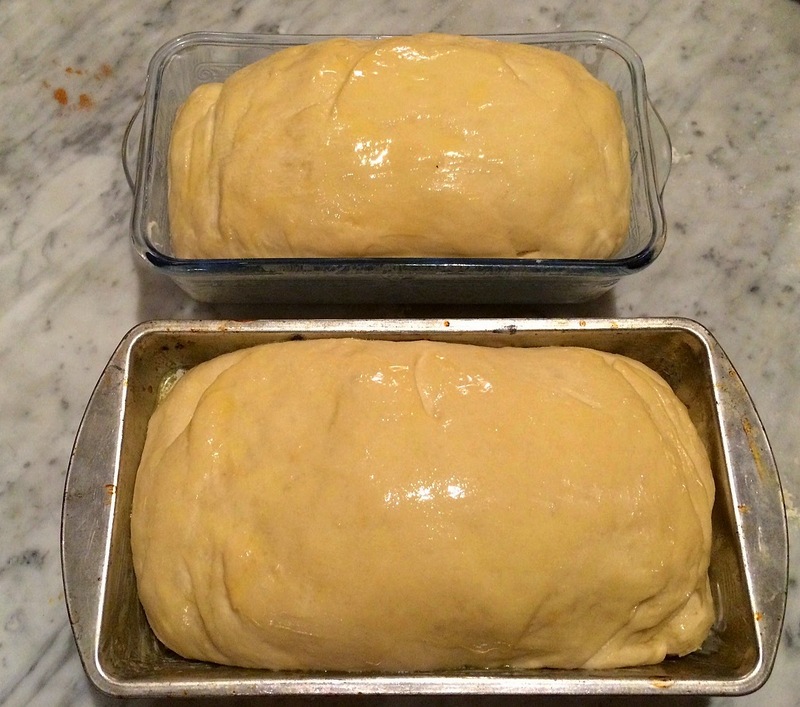 Divide dough and place in two greased bread pans. 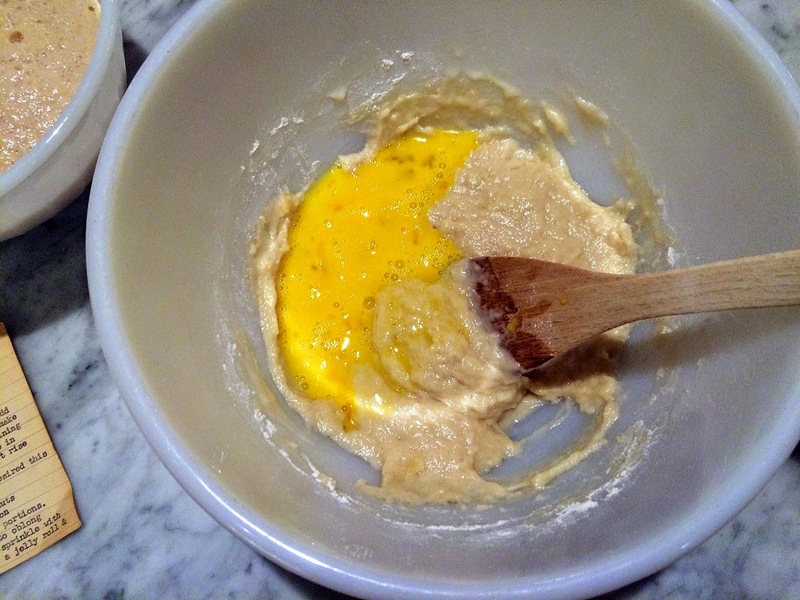 Brush top with melted butter or shortening. Bake for ten minutes in a 400 F oven. Lower heat to 300 F and bake for 45 minutes. Remove to rack, cool slightly and turn out bread. Cool completely.